I need to be in Paris for two days at the end of June, returning home on a perennially expensive Friday evening. As my hotel is only three metro stops from Gare du Nord it made sense to take the train back rather than fly. With cash tickets reassuringly expensive for booking two weeks in advance, this was a good opportunity to check out the new ‘guaranteed availability’ benefit of redeeming with Club Eurostar points. As I didn’t have any Club Eurostar points, this required a transfer from American Express Membership Rewards. I thought it was worth looking at the value I got from this. 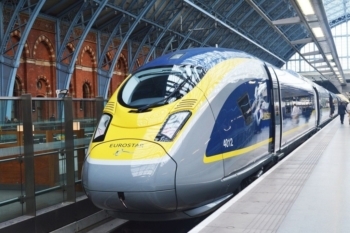 Club Eurostar is the new Eurostar loyalty scheme launched last Autumn. It replaced the two previous schemes, Eurostar Frequent Traveller and Eurostar Plus Points. Reward availability with Eurostar was always pretty good. It is now perfect, because under Club Eurostar you can book on ANY train in ANY class as long as you are prepared to pay a small premium. Tickets can be booked as singles or returns in any of the three classes. All Eurostar routes cost the same number of points, making the South of France and the Winter ski services excellent value. Friday night Eurostar tickets are not cheap …. I didn’t want to travel in Standard, as 2 hr 20 min in a full train did not really appeal – and the saving was only £50. The idea of a private solo seat in Premier was far more interesting. However, you can only transfer Amex points in multiples of 1,500. This means that the Standard Premier ticket would actually have cost me 19,500 Amex points. The only differences between Standard Premier and Business Premier are better food, lounge access and 10-minute check-in. I have lounge access via my Amex Platinum charge card. Despite that, I still decided to use the extra 3,000 points for Business Premier as life is short and my Membership Rewards pot is large – although I doubt the meal will be worth the notional extra £25-£30! However …. I always stress that you should value redemptions based on what you would reasonably have paid. Would I have paid £303 for Business Premier when Standard Premier was £215? No way. I didn’t mind using an extra 3,000 Amex points though. You could also argue that I didn’t need to get the Friday peak train. If I had waited until 6.45pm I could have bought a Standard Premier ticket for £137. If I’d done that, though, I wouldn’t have been home in time to put my kids to bed which is something I don’t like to miss if I can help it. There would also have been a lot of hanging around given that I couldn’t have pushed my hotel check-out beyond 4pm. Other points to note …. 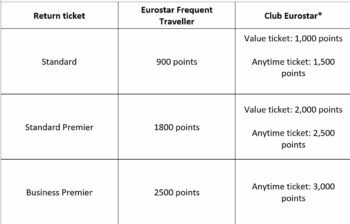 Had I booked earlier, I would have been able to get a one-way Standard Premier ticket for 1,000 points instead of 1,250 Club Eurostar points. I ended up with a pricier ‘Anytime’ ticket. ‘Anytime’ tickets have one important bit of upside if you are converting points from Amex. Because you are guaranteed to be able to redeem the seat you want, you don’t need to worry about reward seat availability disappearing whilst you wait for the points to transfer across. As it happened, it took 48 hours for the points to move across from American Express to Club Eurostar. My accounts were already linked – if yours are not already linked, the first transaction may take a little longer. Without wishing to state the obvious, there are no taxes or charges on Eurostar redemptions. Free means free. With a bit of organising and advance booking, you can get a return Standard ticket from the centre of London to the centre of Paris – or south of France – for 15,000 Membership Rewards points all-in (no taxes or fees) so it can offer a decent deal. I ended up paying a lot more but that is the price you pay for booking a Friday night train in a premium cabin at two weeks notice …..
What is the best replacement for the UK Lufthansa Miles & More credit card? So you had to spend 22,000 pounds on your Amex to get a train that you could have paid £150 for. Even paying £300 does not sound like good value. But then you would not have paid the 300 in any event. This is one scenario where I do actually use the corporate travel agent as Biz Prem capped at £412 return. When a single referral from Amex Plat nets the referee 18,000 points, spending 22,000 can feel like small change. I have stopped discussing the tax treatment of HFP trips (ie if I pay cash I get a 50% discount) because it causes massive distortion to the discussion! I also find that I do not act rationally anyway. On a more practical level, if I don’t blow points for HFP travel then I start running devaluation risks, which is something you can’t price in but which I am aware of. I am also at the point in life where I need to factor in the ability to spend them before I die (I overtake the age my Dad died in a few weeks) as the estate would clearly prefer the cash! Your wife didn’t seem much into the points game when I spoke to her at the HfP xmas party! Oh that is Soo true. I can’t even persuade her to churn an Amex Platinum. I think I should churn her, far easier. if you do some rewards hacking plus referral, you can get 22k MR points in a snap. Nope you had to sign up for an AMEX gold and spend £2k in 3 months to earn that. Travelling at half term a couple of weeks ago, Business Premier made a huge difference in that we didn’t have to queue for check in at either end. The queues were huge particularly at Gare du Nord where everyone else was queuing even to get up the stairs to check in. Do standard premier passengers get to use the fast track check in barriers if they want to or is it only business premier who get to use it as part of arriving 10 min prior to departure? A lot of man maths to justify that redemption. If points are outside the scope of income tax for points earning, I doubt they’d be in scope to be used for allowable expenses for the purposes of trade (especially here when earned through trade). Thoughts? Down to sensible/ reasonable interpretation of the rules, I doubt if your accountant would recommend it but conversely I also doubt that if a tax inspector looked at your expenses claim and disagreed on that point, if he’d penalise you – probably just give you guidance for the future as it’s clearly not a deliberately false or fraudulent claim. Anyway, going back to value (even if personal expense), surely many people would be comparing the cost & convenience of business premier (22,500 MR points, 10 mins away with no significant waiting time) with the cost & convenience of flying (15,500 Avios + £50 [or – say ≅ 20,500 MR points], 45 mins to airport, 2 hrs check in & hanging around, flight a bit faster then 30 mins travel home). So for ≅ 2000 MR points or £20, you save 3 hrs of extra hassle. I don’t count them on the way, I don’t count them on the way out …. Eurostar is certainly much more convenient. I’ve never flown to Paris. Need to rush back in a few weeks’ time for wife’s birthday and should be Paris office to home in 3.5 hours. Picked up a Europcar £1 deal from Reading. To Heathrow this morning. Given a Jaguar XE… very nice ! I got a Hyundai i10 from Cardiff Airport last weekend. With a dent that I hadn’t seen.. would have been an expensive £1 rental if it weren’t for Amex Plat excess cover. When I look I can never find a £1 car back from Heathrow. Is it just me or is this normally the case? From airports is much more limited than to them. Just booked for £1 and paid £2.39 excess cover! No plat at the moment. Was the excess cover for £ 2.39 offered by Europcar when picking the car up or was it seperate cR rental insurance from independent company? Never seen anything FROM airports, only TO… Cardiff airport last weekend being an exception. found it on card management..
Do the gates really close 30 minutes prior to departure? In my experience this time is purely advisory and the gates still work past 30 minutes, i.e. there isn’t a hard cutoff. Although I think I’ve only pushed it a few minutes. T5 agents are meant to be very strict about all matters conformance, if you’re 1 minute late for Security you won’t be allowed past boarding pass check & I imagine gates are similarly fairly strict. Other terminals, other airports maybe not so bad. I had issues adding my Eurostar ID to Amex Member Rewards, called up and we got there after three attempts. I then had issues redeeming with the ID I added, so had to call again. My advice would be, if your Club Eurostar ID is problematic when you add it online, call Amex Customer Services and do the lot (add account and transfer points in one go. You can park them – they will expire at some point but not quickly. a friend of mine has a ba account with points that expired…., does anyone know if there is a option to revive them ? Can always call but BA is not known for it. Starwood gave me some back once.